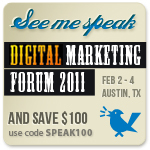 I’m preparing my content for the upcoming Marketing Profs Digital Marketing Forum 2011 in Austin, TX (February 2-4, 2011). In doing so, I realized I never posted my content from the last Marketing Profs event I attended (Marketing Profs Business-to-Business Forum in May 2010). My hope is that there is some value from what’s here, so I wanted to share. I was part of a panel on a variety of topics, and my content focused on why listening paid off for us. I didn’t go into the full details (sorry if the title is misleading – there are still some actionable steps in this presentation), because it would expose a bit of our business that I’m not quite ready to do so. In any event, it walks through the critical first and second steps of a social media program: setting objectives, and then listening. The core of the presentation focuses on some of the free tools one can use to conduct a listening exercise, and a spreadsheet that helps quantify inherently qualitative data. The slide deck (hosted on Alan Belniak’s SlideShare account) is embedded below. I welcome any comments, feedback, or questions. Also, if you’re interested, you can come and see me (and others) speak in Austin, TX this February. Marketing Profs is holding their 2011 Digital Marketing Forum from February 2 – 4, 2011. If you register for Digital Marketing Forum with code SPEAK100 you can save $100 on an in-person registration.